Talent in motion: Participants demonstrating their hair-dressing skills during the award ceremony. KUALA LUMPUR: The barbershop renaissance is not a case of “hair today, gone tomorrow”. In fact, the fast-growing industry will never stop being relevant despite the changing economy, said Majlis Amanah Rakyat (MARA) Chairman Datuk Dr Awang Adek Hussin. “Hair-dressing is an important modern-day lifestyle because it adds to one’s self-confidence and image. “In an increasingly competitive world, appearance and confidence are vital to ensure one’s success,” he said during the Hair In Trend (HIT) Barber Award Nite 2017 at the Premiera Hotel here on Thursday night. This includes cutting, styling, equipment sales and hair products. There are 40,000 hairdressers nationwide, with 20% or 8,000 of them bumiputra. Faces of the future: The 20 barbers who underwent the HIT Barber programme posing onstage during the HIT Barber Award Nite 2017 at the Premiera Hotel. “Based on statistics, it is clear that many business opportunities can be crafted in the industry,” said Dr Awang Adek. Realising its vast potential, he said MARA rolled out the HIT Barber programme for the first time this year. 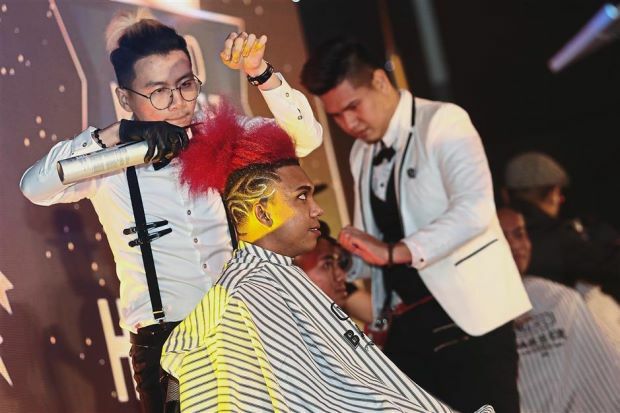 The programme, which is under its Entrepreneur Development division, is aimed at developing more professional barber entrepreneurs among the youth and raising the standards of barbering in Malaysia to a higher, more professional level. For a start, MARA held a seminar on barber entrepreneurship transformation in August this year, which had close to 500 participants. From the seminar, 20 barbers were handpicked by MARA to be groomed as entrepreneurs and professionals. The HIT Barber programme, which runs from August to November, consists of training in barbering skills and entrepreneurship. “The HIT Barber programme will also provide a comprehensive business ecosystem, namely entrepreneurship development training, business funding, infrastructure facilities and branding development,” said Dr Awang Adek. By January next year, MARA is targetting to have at least 10 HIT Barber-branded barbershops opened by participants, who will continue to be guided from time to time by MARA. “Via this programme, it is expected that 10 HIT barber shops plied by the participants will be opened under the brand of HIT Premium Barber, HIT Mobile and HIT Express Cut,” added Dr Awang Adek. HIT Premium Barber is premised on a prestigious business concept, whereby the shop will be located in a prime area with upmarket or high-class services offered. HIT Mobile will be offering a “barber-on-wheels” experience for customers using a modified truck. For HIT Express Cut, fast, quality and cheap haircut services will be on the table. MARA will provide participants with funding, infrastructure and consultancy should they decide to open these HIT Barber-branded shops, said Dr Awang Adek. “I’m confident that the HIT Barber programme will be another platform to increase the number of bumiputra entrepreneurs in barbering. “I understand that even now, there are those among HIT Barber participants earning RM20,000 a month despite operating on the outskirts. “I also hope that through this effort, it will be able to change the attitude of bumiputra entrepreneurs about the hairdressing industry as one of the markets that could guarantee a high income and with a bright future to be professionally ventured into,” he added. The HIT Barber programme is also expected to be continued next year, said Dr Awang Adek. He said he had a deeper appreciation for the hairdressing industry after getting a professional haircut from national expert hairdresser Khal Jaksa on Thursday. “At first I was worried because I thought my hair was beyond help. I usually get a haircut at normal barber shops and not by experts like Khal. “But after looking at the result in the mirror, I could see the difference. For the first time in my life, I feel happy and satisfied with my haircut,” he said.